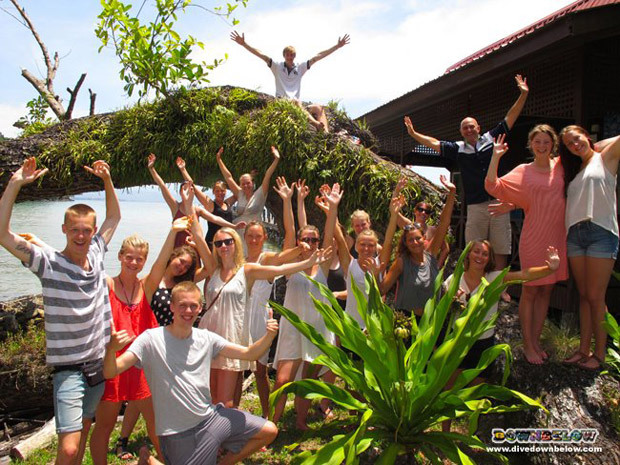 Our adventurous Danes vacated the island last week and headed off to Mt. Kinabalu to continue their Sabah adventures. While they were on the island and in the capable hands of resident PADI Course Director Richard Swann and the rest of the Downbelow Instructors, the Danes completed a slew of PADI diver training courses. Amongst the 18 strong group of Danish adventurers, Downbelow qualified 16 Open Water divers, 2 Advanced Open Water divers, did 2 Underwater Photography courses and 18 Coral Reef Conservation courses. Well done to the Danes for mastering, with smiles all the way, the steep learning curve, and to the Downbelow staff for successfully guiding the Danes through their diving adventures. The Danes are almost immediately succeeded by our next group, but more about that in an upcoming post.